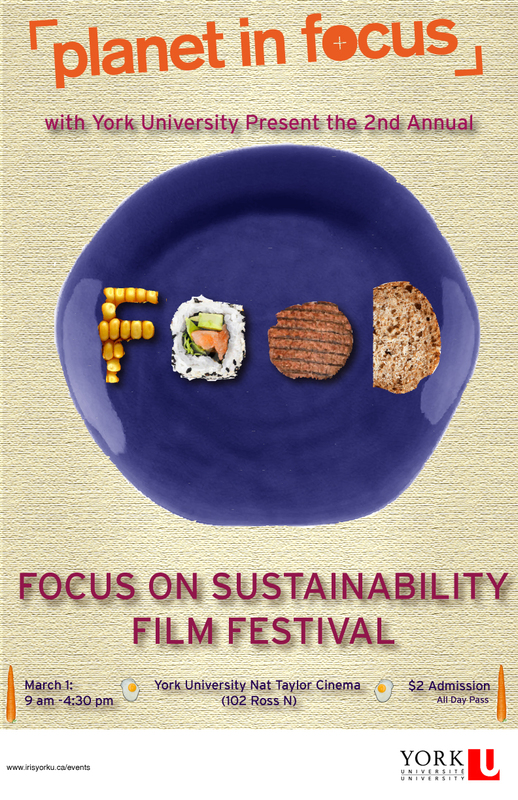 ‘Planet in Focus with York University Present: Focus on Sustainability Film Festival’ – the annual event with its sophomore theme on food! This entertaining and educating experience features domestic and foreign documentaries, a panel discussion with filmmakers, foodies and academics, as well as prizes provided by Fresh Restaurant, MamaEarth Organics and Front Door Organics and more! Please join us on Friday, March 1st, 2013 in the Nat Taylor Cinema (North Ross 102 at York University) from 9:00am to 4:30pm. $2 for all day access. Our panel discussion will start at 1:30pm. We will also be joined, via Skype, by Mark Hall for a brief question and answer session after the showing of his film, Sushi: The Global Catch. Many thanks to our supporters for providing these great door prizes! The Climate Consortium for Research Action Integration (CC-RAI).